The World Visual Reference System makes a traditional family Bible into an exciting devotional tool. The promises and miracles of the Bible plus the messianic prophecies to the first and second Advent are indicated with visual symbols throughout the Bible. Brief introductory facts are listed at the beginning of each book. Of course, we are including classical biblical art from the great master artists and a complete 16-page registry to record family traditions, events, and geneaological records for keepsake and legal records. We have also included a 16-page section of childern's Bible story art and eight pages of color Bible maps. 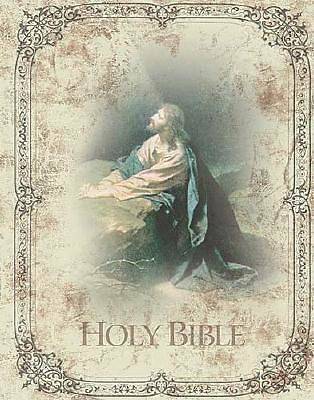 Along with these, you will find a Bible dictionary, Chronology of Biblical Events, Where to Find It in the Bible, and Calendar of Daily Bible Readings. The Bible's cover features a unique antique treatment of the master art work, Christ in the Garden.